Only in North Korea  the world's most opaque, secretive state  could the country's most important political conclave in 30 years appear to be imminent and yet entirely shrouded in mystery. It was rumored this week that delegates from all over the country are streaming to Pyongyang for the first congress of the ruling Workers' Party of Korea (WPK) since 1980. But no one in authority has said publicly when the event would start, how many days it would run or what the agenda and purpose of the meeting might be. At the time of the last party congress, Kim Jong Il's father, Kim Il Sung, was still in charge, and the point of the exercise was to solidify the position of the Dear Leader as heir apparent to the Great Leader. Now, a generation later, the agenda appears to be similar. A statement earlier this summer from the Political Bureau of the Workers' Party said a meeting in early September "would elect [the party's] highest leading body to reflect new demands of the party and for the development of the revolution." Translated from tortured communist-speak, that means the meeting is all about the boy: Kim Jong Il, whose health has been shaky since the stroke he suffered in August 2008, is moving to ensure that his third son, Kim Jong Un, will take the reins whenever dear old Dad pops off to wherever it is that ruthless communist dictators go when they die. "The power succession from Kim Jong Il to Jong Un is expected to be made official," says Cheong Seong-chang, a senior fellow at Seoul's Sejong Institute, a leading South Korean think tank. Even though the succession process has been under way for more than 18 months, little is known about Kim Jong Un, other than that he's in his late 20s and attended a boarding school in Switzerland as a boy. Most analysts believe that his political standing in the North has been overseen by a regent of sorts: his uncle Jang Song Taek (Kim Jong Il's brother-in-law). According to Cheong, Kim Jong Un has in the past year taken on roles in the General Political Department of the North Korean army as well as in the State Security Ministry  the two key centers of authority in North Korea. "The swift establishment of a succession structure," says Cheong, "is deeply correlated with the fact that Kim Jong Il's health [remains] unstable." Whenever the party conclave begins (one NGO in Seoul that claims to have sources in the North reported that it began on Wednesday, but there is no confirmation of that), outsiders will be looking to see what new position Kim Jong Il's son is handed. Cheong believes that Kim Jong Un will be appointed a secretary within the Central Committee of the Workers' Party. Hwang Jang-yop, one of the most senior defectors from North Korea, has said that the Central Committee secretaries wield great influence in the regime. Outsiders are also looking to see whether the young Kim is given a senior position in the Central Military Commission. Analysts say either promotion  and most certainly both  would indicate that the succession is solidly on track. Analysts believe that adding to Kim Jong Un's résumé over a period of years is the only plausible way to mollify those within the North Korean elite who might harbor doubts about the young man's ability to run the country. Indeed, at the 1980 party meeting, Kim Jong Il was named a party secretary and a member of the Central Military Commission. The Dear Leader didn't take over from his father until Kim Il Sung died 14 years later. North Korea watchers have no sense of how the dynastic political maneuvering will affect the long-suffering citizens of the North. The press is once more full of speculation that in the wake of Kim Jong Il's surprise trip to northern China a couple of weeks ago  he met with Chinese President Hu Jintao in Changchun on Aug. 27  the North may launch new economic reform. China's media reported that Kim once again visited a few Chinese factories and reiterated his interest in how China had reinvigorated the northeastern portion of the country. If Kim Jong Un's rise signals a youth movement within the North Korean leadership, as some have speculated, then perhaps he will manage the country more pragmatically and finally ditch the hard-line economic ideology that has driven North Korea to penury. The only problem with this optimistic line of thinking is that there is not a shred of evidence to back it up. Kim Jong Il has been to China several times over the years and is always reportedly awestruck at what his Chinese communist cousins have accomplished. They urge Kim to follow their enlightened economic path. Then the Dear Leader returns to Pyongyang ... and nothing happens. Perhaps Beijing doesn't care that much, or doesn't have that much influence over what happens in North Korea. But the impact of China's economic miracle, now more than 30 years old, on North Korea has been negligible. Maybe young Kim Jong Un, if and when his time comes in the next few years, will be different. 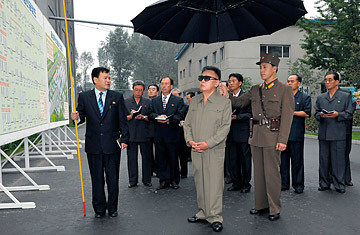 But those who claim to have any insight into the intentions of North Korea's heir apparent are kidding themselves. The Kim family has presided over a dynastic depression in a country that, decades ago, used to be more prosperous than South Korea. All that anyone knows is that the dynasty appears set to continue. If you were a North Korean, would that cheer you up? See pictures of North Koreans at the polls. See pictures of a Korean War re-enactment.